The original smart phone, “Simon”, was introduced to the world in 1994. Since then cell phones and other digital technologies have advanced at lightning speed. The number of children who have access to these devices is also rapidly expanding and changing how children learn, grow and interact with their world. Educators, parents and communities are challenged to support children and youth as they navigate our ever changing digital world. There are screen time guidelines for young children from the Canadian Paediatric Society. For school aged children and youth, Media Smarts – Canada’s Centre for Digital and Media Literacy, offers information and resource for parents as well as teacher resources including lesson plans, games and professional development opportunities. An American resource, Families Managing Media, provides practical information such as how to determine if a child is ready for a cell phone, the impacts of social media and gaming on young brains, screen replacement activities and more. In Alberta in 2015, a comprehensive and long-term analysis of the impact of digital technologies on Alberta children and youth’s health, development and learning was launched. Growing Up Digital Alberta, is a 10-year, collaborative research project that examines the scope of the physical, mental and social consequences of digital technologies on Alberta’s children and youth. Researchers from the Alberta Teachers’ Association, Harvard Medical School, University of Alberta, and Boston Children’s Hospital have already gathered the perspectives of educators and parents/caregivers. Generally teachers and principals perceive that Alberta students’ readiness to learn has been in steady decline. There is a strong sense among a majority of teaching professionals within this sample that over the past 3-5 years students across all grades are increasingly having a more difficult time focusing on educational tasks (76%), are coming to school tired (66%), and are less able to bounce back from adversity (62%). Concurrent to this, 44% of teachers note a decrease in student empathy, and over half of the sample (56%), reported an increase in the number of students who have discussed with them incidents of online harassment and/or cyberbullying. Dr. Phil McRae will also be a keynote at the 2019 Southeastern Alberta Teachers’ Convention. 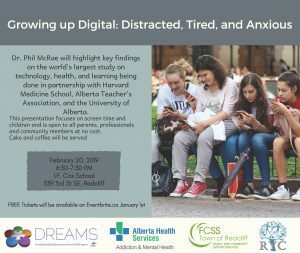 In this keynote address, Dr. McRae will explore some of the key trends that are actively (re)shaping Alberta’s children and youth and open up a conversation about achieving a fine balance in a digitally saturated world. Video Games and Online Gaming: What’s the Real Score?